The parents of 11-year-old Rhys Jones, the boy shot dead in Liverpool, were in court to see a teenager being remanded into custody accused of his murder. Melanie Jones, 42, and Stephen Jones, 45, saw the 17-year-old boy brought into the dock at Liverpool Magistrates' Court, after an eight-month inquiry. The boy, who cannot be named, is from the Croxteth area of Liverpool. 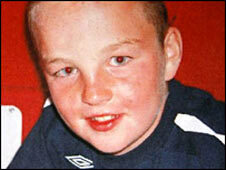 Rhys was shot in the neck in Croxteth Park on 22 August last year as he was walking home from football training. Gary Kayes, 25, Melvyn Coy, 24, another 17-year-old boy and two boys aged 16 are charged with assisting an offender. 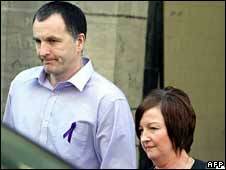 All six appeared at Liverpool Magistrates' Court where they were remanded in custody until 25 April. One of the 16-year-olds is also charged with being in possession of a revolver, ammunition and a replica 8mm pistol. All the teenage defendants are from Croxteth. Mr Coy and Mr Kayes are from the West Derby area of the city. Rhys was killed in the car park of the Fir Tree pub near his home. Police arrested 13 people on Tuesday and Wednesday in connection with the youngster's death. Three people, aged 49, 50 and 54, and a 16-year-old, have been released on bail pending further inquiries. A 22-year-old man was also bailed on Tuesday night. A man aged 20 remains in custody, while a 21-year-old woman has been released without charge. District Judge Richard Clancy agreed to remand the 17-year-old accused of murder into custody for one week, but said he hoped a trial could be started as soon as possible. Addressing the defendant, he said: "You appreciate you are charged with an extremely serious matter. "You will be remanded, in the first instance to 25 April at 9.45am. We will try to deal with that by video link." The second 16-year-old boy charged with assisting an offender is accused of disposing of the murder weapon, clothing and a bicycle used in the killing. The other 17-year-old is also accused of helping dispose of the murder weapon and clothing.